The body (Tumba) of these instruments are usually made from a dried gourd. 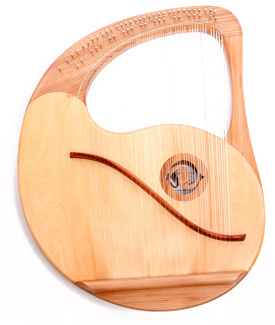 The belly of the instruments which are made by me, are made like the lute, from bent ribs. These bent ribs are glued sidely together. The body of my instruments, exists either of 17, or of eleven trims. All instruments are unique specimens from different kind of wood. The wood I use till present are: mahogany, teak, maple, cherry and oak. The ornaments are produced of inlays and dyed engraving. The instruments are made almost completely by hand. This means an intensive process, a conscious penetrating all work processes, which gives the instrument a special aura. Working with maschine does'nt give the same result. An instrument can be made very individually, as desired of the future owner. Kind of wood,Organization and embellishments can be chosen in a special way. It exists of a dried gourd which is connected by a preformed piece of wood with the neck. The neck is hollow. Therefore the whole instrument is a sounding space. Two bridges stand on the board which covers the sound body. A bigger bridge which seven strings run at the top of the neck and are tuned with the bigger pegs. 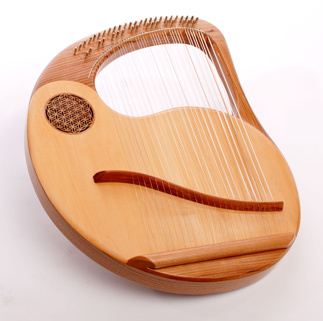 The melodie strings are shortened by pressing the string on one of the twenty bent metal frets which are bound with a special woven threath on the neck. Playing the string and pulling it over the bent fret, you will hear a fluently sound. The melody strings are played with a plectrum (Mizrab). The sympathetic strings are tuned to the sound material of a Ragas, and resonate if tuned to the right pitch. This produces a spatial sound, rich in overtones. The sound which so typically for the Sitar, appears from the bent grinted bridge. The string produces a rattling sound. The procedure to give the bridge the right shape is called jovari. Jovari means „ giving life"
There are different kinds to give shape to th bridge. A very open shapened bridge. With this shape the strings are rattling the most. Here one could classify the sound of Ravi Shankars Sitar. A very closed shapened does not rather rattle and has a sustaine tone.The sound of Vilayat Khans Sitar is to be ordered here perhaps best. The shape in between of these two types, sounds like the sound of the Sitar of Nikhil Banerjee. In between there are still different shapes in one or other direction. Since 2011 I have been involved with the construction of lyres. In our joint workshop, my colleague and I are developing new instruments in the field of soprano alto and tenor mood. For pedagogical purposes, a new model was developed. We make our own strings for the instruments.